People have been drinking coffee for hundreds of years, maybe even more. But where did it come from? Who was the first person to discover those magical beans that everybody knows and loves today? 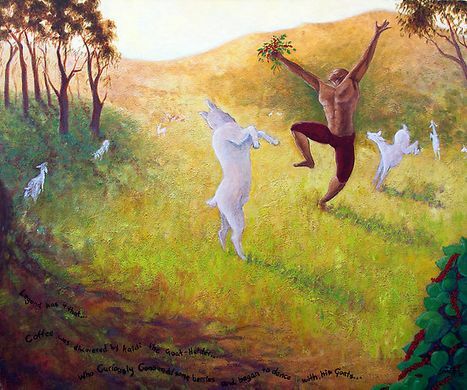 According to popular legend, we have Kaldi the goat herder to thank! The story goes like this. Kaldi was a young goat herder in the mountains of Ethiopia. One day Kaldi observed his goats acting strange. Their usual calm behavior was replaced with prancing, frolicking, and dancing. They had so much energy they didn’t sleep that night! At first, Kaldi thought they were possessed. After some investigating, Kaldi found that the goats had been eating from an unfamiliar tree with red berries. Kaldi, feeling adventurous, decided to try the berries. After eating a few, he joined the goats dancing and frolicking around. He became the happiest goat herder around! Later on, a monk was passing through and observed Kaldi and the dancing goats. Intrigued, he stopped to see what was going on. Kaldi told him about the red berries, and the monk was convinced they were an answer to his prayers. He explained to Kaldi that he would always fall asleep mid-way through his prayers. When he ate the mysterious red berries, he was able to stay awake! He stayed up for hours and hours, praying in the state of divine ecstasy he had always desired. Since that epic day of discovery, coffee has evolved into an almost cherished beverage enjoyed by people all over the world. Thank you, Kaldi! These goats appear to have consumed some Uncommon Grounds Coffee…. P.S. Look for the goat on our spring blend coffee bags! !